How to give a way money or gift voucher to a birthday? Right, with a nice self-made card. 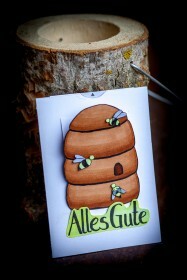 I created this ‘Happy Bee-Day!’ card. The illustrations are hand-drawn and colored with Copic markers. 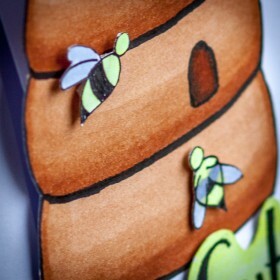 The bees are sticked down using some foam tape to get a little 3d effect. Finally if you pull small arrow at the top and the card will show his little secret. This secret can be a secret message or as it is shown here money. 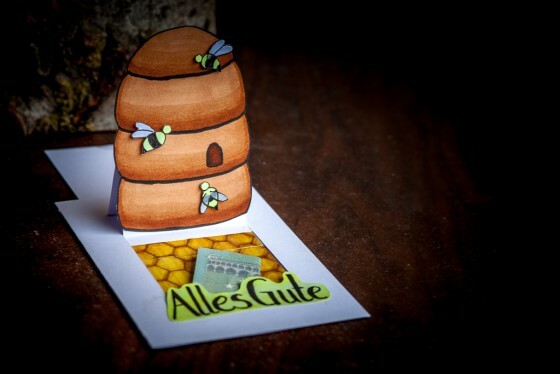 This card is creative way to give away a gift voucher or money.